What a classless way to end a tragedy. Only to the family and most of society. Not to the OHP....obviously. Three years after beaten by OHP, charges dropped against deaf victim. Being deaf isn't an excuse to hit and run. He is still facing a misdemeanor in Cleveland County for alleged involvement in the hit and run incident from that night. Oh, he backed into the troopers car and drove off. That certainly justifies being beaten to a pulp by two armed men. Im speechless that anyone could defend what was done to that man. Didn't watch the video. Probably excessive. He also should have known not to drive away from an accident. I was always taught, don't make the cops chase you or when they catch you, they will make you pay for making them run. You're introducing "alternative facts" that while relevant and factual parts of the story, they are not important regarding Vashta's agenda. Hit and run is a misdemeanor, so is jaywalking, and not an excuse to beat the lawbreaker. How about you let the courts decide what is alternative, relevant and factual. Spent any time around hearing impaired? Think the OHP ought to have some training in that area? I have and I do. It is an impairment that seems to be growing due to environmental factors. Yes, I do have an understanding of dealing with speech/hearing/vision impaired. I was part of the ADA team with my job being compliance with telecommunications equipment. My comment was a reference to the usual one sided viewpoint, and the ignoring of other facts by Vashta. 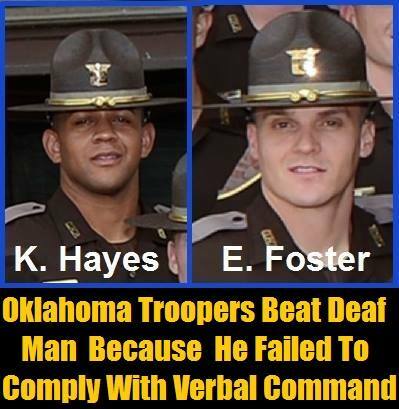 Does the OHP not teach troopers some basic sign language? This is something that should have been implemented years ago, but I forget, the state wants to spend money on a 10 Commandments Statue ballot question since it's the most important thing. I try to filter out posters passions and deal with their information delivery. Yes, he/she is one sided. In this case it seems there is pretty much one side. We will end up paying out some tax dollars cause I doubt seriously they get any basic sign language other than a middle finger! It is an impairment that seems to be growing due to environmental factors. I WONDER IF IT HAS ANYTHING TO DO WITH LOUD MUSIC. I'm quite sure it does. When I was carting around hearing impaired children I began to notice that congenital hearing problems were much more common than I had known. Apparently, there are environmental and chemical determinants at play. Drug use during pregnancy, damaged chromosomes, poor pre-natal care. Amazing technology is being applied to deal with it. Sign language will always be like a first language for them but technology is affording some other solutions. The good news about that is they tend to be very precocious children. They have to learn two languages early on, signing and signing in English. They also learn to read lips and social signals very well. Smart kids. Pearson keeps a placard in his car that reads: "Driver is deaf. Failure to follow verbal commands means I am NOT hearing you." He had the placard in his car the night he was arrested. The Oklahoma Highway Patrol is using a formula to evaluate troopers based in part on the number of tickets they write and number of arrests made, records show. One policy sets goals for northeastern Oklahoma's Troop L of about four tickets for every 10 traffic stops and 30 arrests per year for alcohol offenses. ...nor does the agency receive much money from writing a citation. If you are going to quote out of context, let me point it out... The COMMA, not a PERIOD. He had the placard in his car the night he was arrested, but he didn't have a chance to show the officers who acted quickly when they pulled him over. And you know why he didn't have a chance to show it? Because he hit something, then drove away. Everyone knows that isn't legal... Again.... When you run, it pisses off the cops.